Church Shows Your Kids Will Love! Jeffini uses MAGIC, MUSIC, and PUPPETS to encourage children to READ & love the Bible!! This new show features fabulous magic, audience participation, AND Jeffini’s puppet friend - Horace the Donkey - as they lead the audience in hilarious stories through the Bible with an emphasis on Songs and Music. This show is designed for kids aged 4 - 12. Teaching kids that Jesus is the Master Builder! The Master Builder Show teaches children that Jesus is at work In us and Through us each day. He is the master builder of our lives! And He invites us to help build His Kingdom... so we are builders too! This show features: Fun and Laughter, Hilarious puppets, Architectural Adventures, Bible stories and historical stories about famous buildings and builders. The show is designed to encourage kids to read their Bible and to follow Jesus. Click HERE for more show info and to watch a video. ​And Jesus said, “The Kingdom of God is like” . . . This fun family show is filled with the parables of the Kingdom. We focus on the three parables from the Gospel of Luke about the Lost Coin, Lost Sheep, and Lost Boy (Prodigal Son) . . . but we have a hilarious time with a lot of kids up on stage helping to act out the stories in very magical ways. We even look inside of the head of the prodigal son and make his head vanish. Truly Great for ALL AGES! ​This amazing Christian Sports Show of captivating stories, magical illusions, and audience participation inspires kids of all ages to see our christian lives as a race, Live for the Kingdom, and make a positive difference in the world for the King. Using sports themes, this motivational show encourages kids to be physically fit AND spiritually fit and to run with endurance the race set before us. The show is 45 minutes long. This Jungle-themed show challenges kids to Think Safe, Act Safe, and Be Safe in Jesus! ​Host Jeffini's Magical Mysteries Show as a fundraiser!!! Are you looking for a great way to raise money for your youth camp, mission trip, missionary, or ministry need? Why not host this amazing 90-minute show of hilarious comedy magic that will appeal to the WHOLE family as a fundraiser. Jeffini offers themed shows for Christmas, Halloween (or Halloween alternative parties), Thanksgiving, Easter, and July 4th or other National holidays. These dates fill quickly. 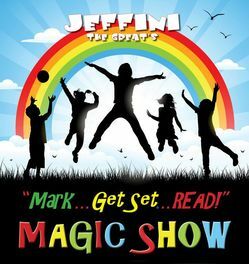 Jeffini offers his Grand Magic Stage Show, Strolling Magic or a combination of both for fairs, festivals and carnivals. His stage show of "just for fun" comedy magic is sure to delight guests of all ages. He is also a master of gathering small groups together for short close up magic “shows” right in your guest’s hands with his "strolling magic & balloon twisting". This entertainment can be geared to folks of different ages including adults, teens, children, or groups of mixed ages. The price for church shows ranges from $325 and $1250 depending on the length of show and size of audience. Contact Jeffini today for a custom quote.